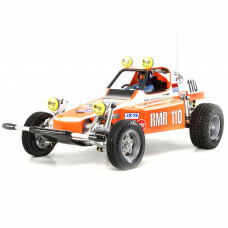 The prominent figure of the R/C car boom was the Buggy Champ which was first released in 1979. Tamiya is now proud to re-release the Buggy Champ to celebrate the car’s 30th year anniversary. The chassis has been finely tuned while maintaining the original features such as the unique front double trailing arms and rear torsion suspension. R/C fans’ hearts will definitely race when they see the nostalgic form and relive the dynamic performance of this machine. Length: 400mm and type 540 motor included. Die-cast front and rear suspension arms, front axle, and wheel hubs have been newly designed. Reinforced front uprights and oil dampers. Comes with durable and lightweight polycarbonate body and rear wing, plus a protective undercowl.